After having grand trailer launch in Paris , Ranveer Singh and Vaani Kapoor have commenced their promotional tour for their upcoming rom-com Befikre. Ranveer Singh and Vaani Kapoor took their carefree attitude to the sets of the cooking reality show, Masterchef India. The duo filmed an episode as the guest judges on the show this past weekend. We have learned that they also showed off some of their cooking skills as well. 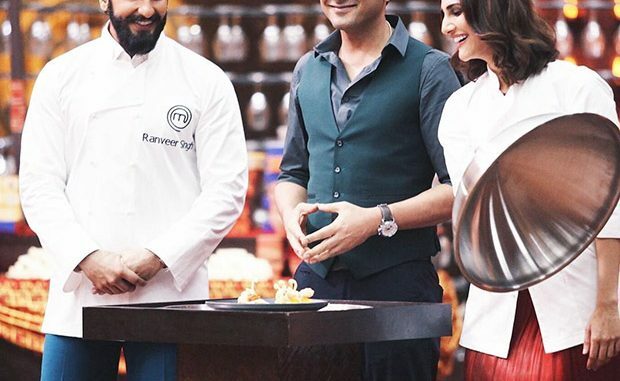 We came across a photo of Vaani and Ranveer donning Masterchef aprons while standing beside the judge, chef Vikas Khanna. Befikre is helmed by Aditya Chopra and is slated to release on December 9. Fredrik Eklund’s Cleavage: Too Much Hgh?